230VAC, Temperature Limit Controller for energy saving. Turns off/on compressor as per adjustable temperature limits. The TLC is a simple, yet efficient Temperature Limit Controller which offers substantial energy saving of Air Conditioning by limiting ‘Set Temperature’. 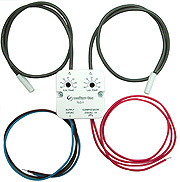 The TLC is compact and easy to install at any existing AC system by connecting the compressor relay line to the TLC, the TLC overrides the AC control system and therefore can limit the Cool/Heat set points. Limit Cool & Limit Heat values are configurable. If ambient temperature from the return air sensor exceeds the predefined limits, the compressor will stop working. The TLC will automatically re-operate the compressor according to these values. The TLC allows significant energy saving in both commercial or residential applications while investment is minimal and installation is quick and simple.